A beach house in Japan? Why ever not? Here on homify 360° we love checking out noteworthy architectural creations, which is why we’ve singled out this stunning little creation for you today. Prosper Design are the professionals in charge of this structure, which is home to a multi-generational family that marries a sense of traditional Japanese detailing with a contemporary ambition that is so unique to what we have seen before. With the incredible surroundings offering up bucket loads of inspiration (think swimming, surfing, and beach-side fun), this home was crafted as a new vision for the modern family to enjoy life in all its beauty. 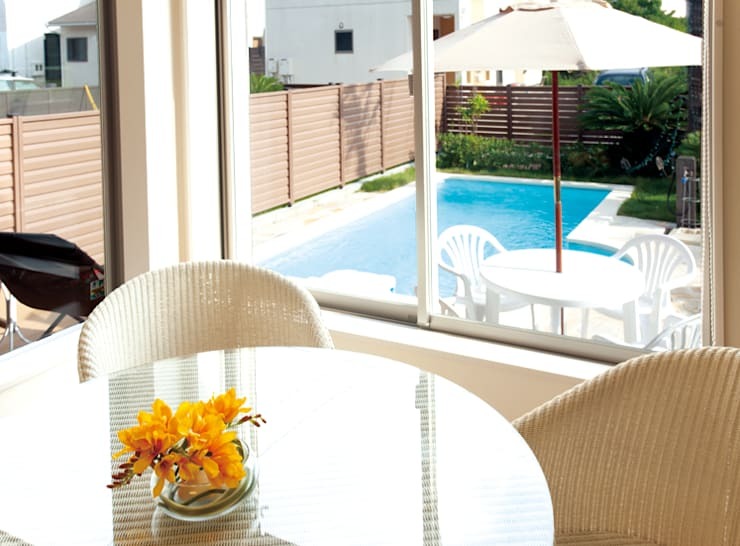 It's a luxurious retreat, a heavenly home for the owners that soaks up not only the sun, but also a relaxing ambience. Let’s discover this fantastic creation together! 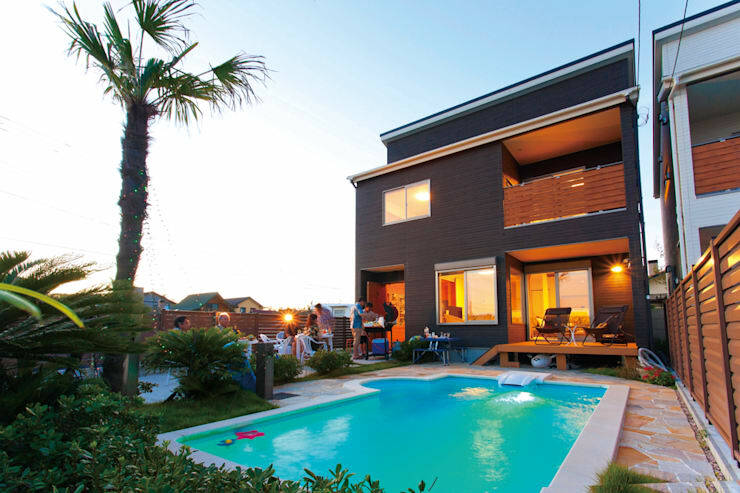 The fabulous swimming pool in the backyard quickly establishes the ambitions of the home's design. This large and open space was created for the family and their friends to ‘have a good time’, whether that involves relaxing, socialising, partying, or whatever else they feel like doing. Our experts in charge of this creation used timber cladding to wrap around the house’s façade. Great choice, as the combination of the geometric shapes and timber cladding sets this house visually apart from the surrounding neighbours. A wooden deck completes the backyard-paradise picture while also beautifully linking up the pool and outdoor setting to the central living- and dining room. Now for a look at the interiors, where the dining- and living room share a splendid view of the backyard setting. 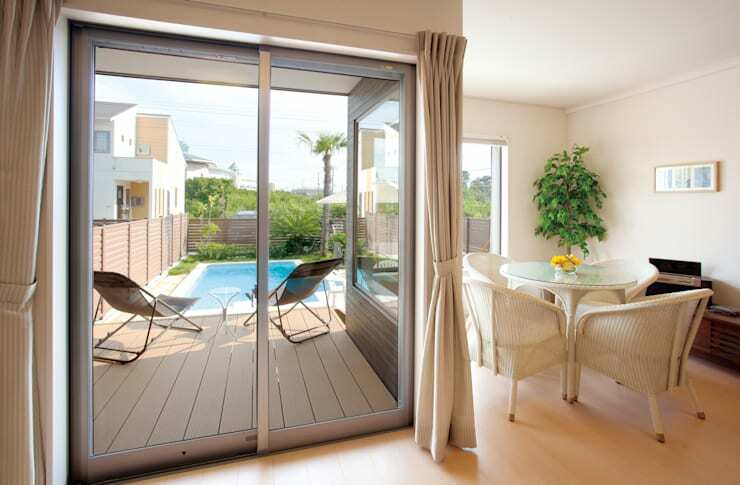 Thanks to windows and glass doors, these interior areas present a sun-filled spot throughout the day, meaning that activities like cooking, dining and socialising can be enjoyed indoors while feeling as fresh as the coastal location. And how about that creamy colour palette, which allows the incoming light to bounce playfully around the room (and contrast magnificently with the cool blues and greens of the yard)? A generous glass sliding door was placed right in front of the dining room, allowing diners to have a front-seat view of the swimming pool. This was not only an aesthetic consideration, but also provides greater safety for those swimming—an especially important factor when there are young children in the household. High fences and lush landscaping ensures those swimming or sunbathing remain out of sight from potential nosey neighbours. It is clear that this family commits fully to their coastal lifestyle – who else would place ready-to-use surfboards in the downstairs laundry- and washing area? 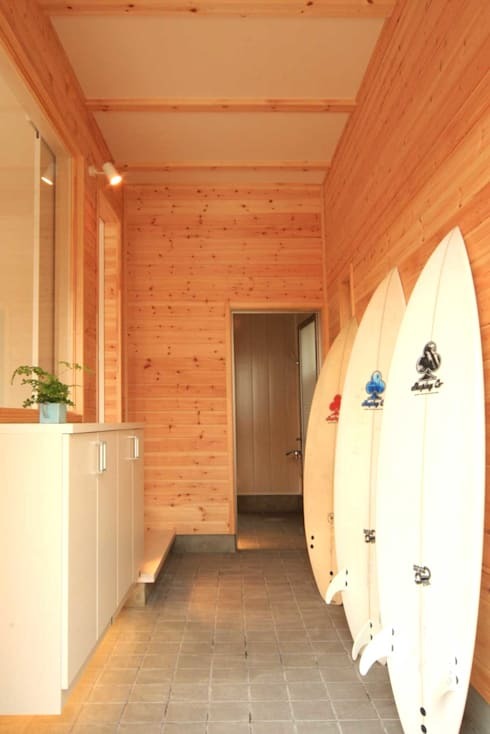 Not only is this a practical spot to keep them, but the fibreglass surfboards also make for an unexpected décor feature against the warm timber panels. Many people associate Japan with sushi and technology, not being aware that the country actually has a considerable surfing culture as well. The east coast and many islands are home to some incredible surf spots that are frequented by international surfing pros. The top level presents, among other amenities, a luxurious space that can’t be called a bathroom – it is much too deluxe for that. Let’s go with the term ‘spa space’ for now, where a spa-like tub offers up a special spot to soak up those sore-from-surfing muscles after a long day at the beach. 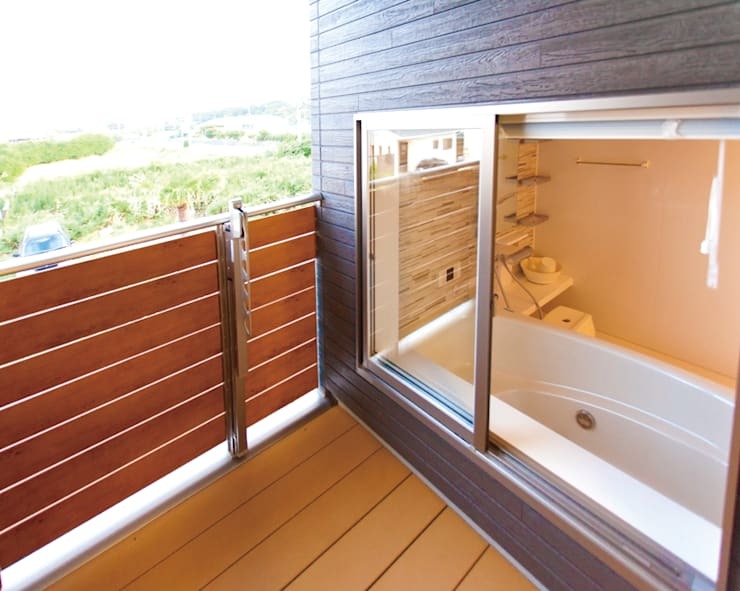 And to take care of the privacy factor, a timber barrier/railing has been placed on the outside, should an inhabitant feel the need to open up a window to allow a fresh sea breeze to enter and enhance the bathing experience. 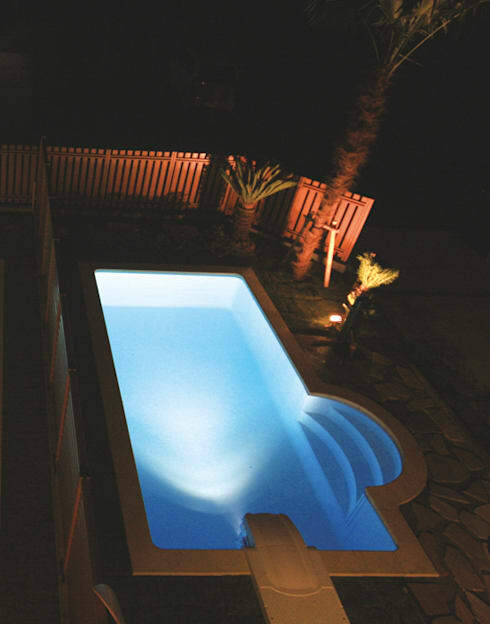 Even after the sun has set, this house can still show off its best side thanks to the built-in pool lighting. Those crystal-clear waters become positively hypnotising, making for an exquisite night-time feature that so many homeowners crave (late-night swim, anyone?). Speaking of all this pool stuff and swimming has us yearning for some cooling-off inspiration. If you feel the same, check out 5 pools for small but modern homes.